Solid Ramps-Solid Wheelchair Ramps-Solid Scooter Ramps all factory direct. Solid ramps offer the benefit of being used as portable access surfaces or installed as permanent fixtures where they're most often needed. Our solid ramps are available in a wide range of sizes, so you can choose a length that best suits your purposes. 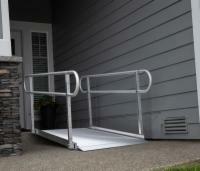 To order your solid ramp now, please call our accessibility experts at 1 (800) 791-6899.